The Stelvio Pass is a high mountain pass at an elevation of 2,757 m (9,045 feet) above the sea level, located in the Ortler Alps in Italy, between Stilfs in South Tyrol and Bormio in the province of Sondrio. 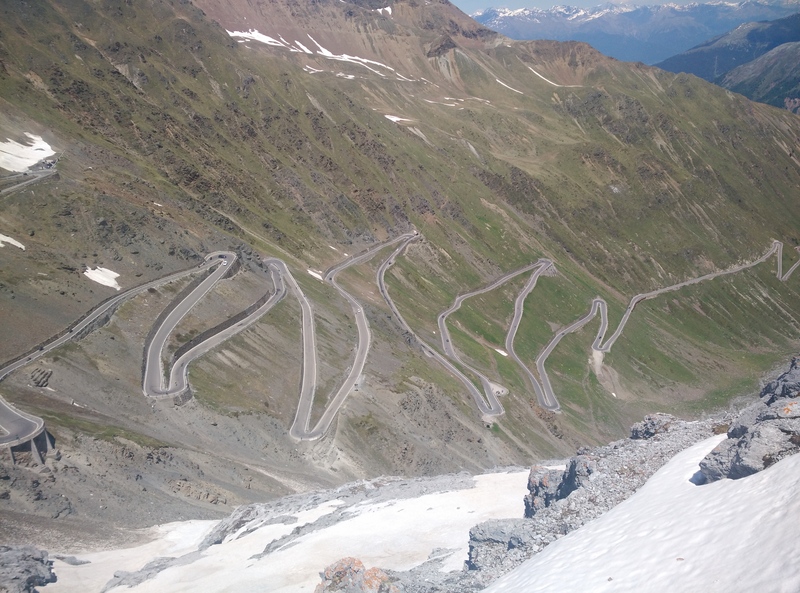 It’s one of the 50 highest mountain roads in Europe. The road itself is a marvel of engineering skills; the exhilarating serpentine sections invite experienced drivers to travel the road just for the sake of it. All in all, this could be the most magnificent road pass in Europe. It’s one of the most scenic drives in the world. 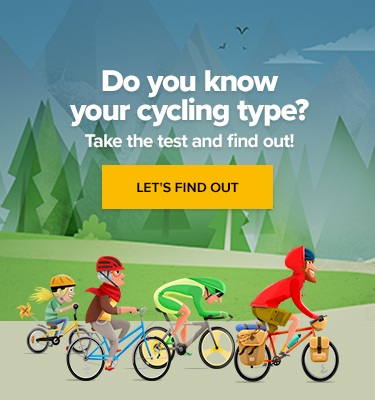 No wonder, when I was asked by my friend to fill in a vacant place and join a group of skilled riders, it didn’t take me long to accept this challenge, as last year I had taken part in one of the toughest races, copying one of the stages of the Tour De France – L’Etape Le Tour. 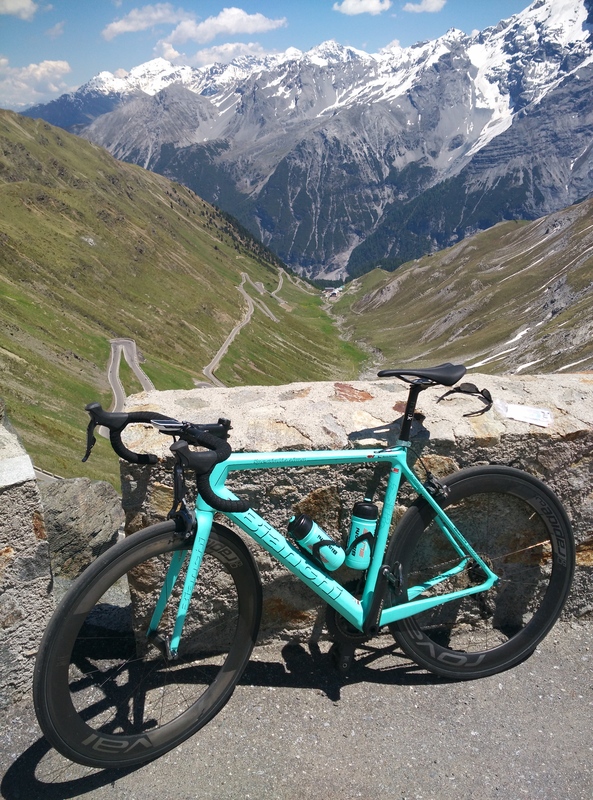 The pass has been climbed by the Giro d’Italia bicycle race several times, and there are 2 routes to reach the summit. This road is usually open from June to September, but it can be closed anytime, when the access is not cleared of snow. 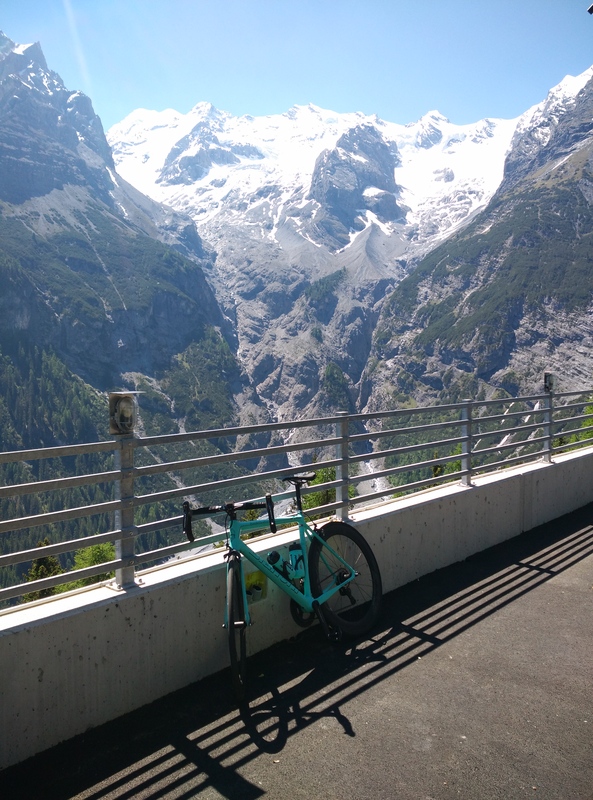 The original road was built during the years 1820-25 by the Austrian Empire to connect the former Austrian province of Lombardia with the rest of Austria, covering a climb of 1,871 m. Since then, the route has changed very little. After 1919, with the expansion of Italy, the pass lost its strategic importance. Starting from Prato, the ascent is 24.3 km long. Over this distance, the elevation gain is 1,808 height metres with average percentage of 7.4%. 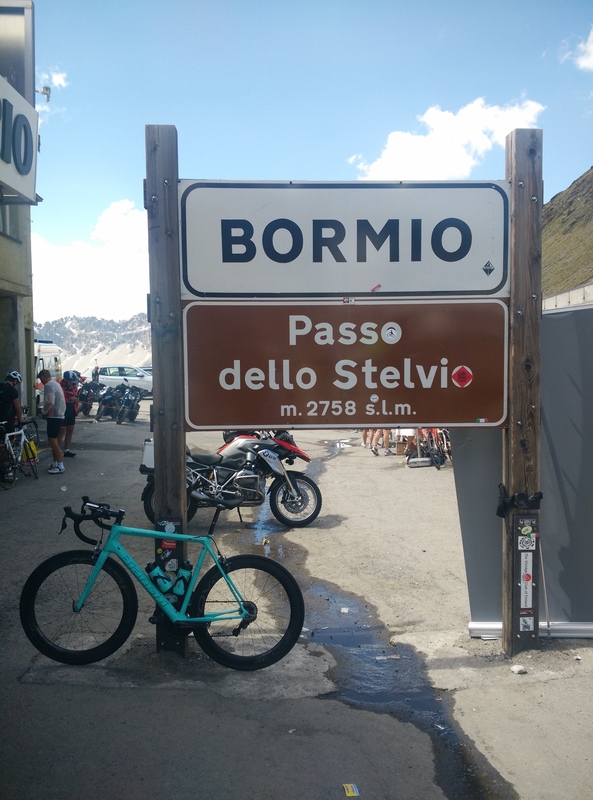 From Bormio, the ascent is 21.5 km long. Over this distance, the elevation gain is 1,533 height metres. The average percentage is 7.1%. 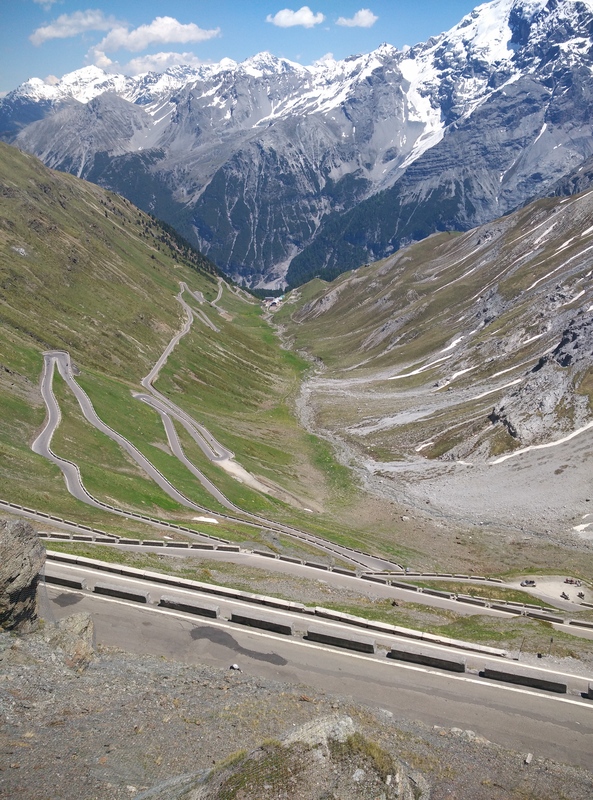 Steeped in pink history, the Passo dello Stelvio is arguably the most mythical of the Giro’s major climbs. The 30 miles of snaking, high-altitude tarmac have seen some of the greatest battles of the Giro d’Italia. This is a climb that is romanticised by journalists and rich in history, but when ridden, it’s rather a grim treatment than a treat. As the legendary Fausto Coppi, nicknamed Il Campionissimo (Champion of Champions), said after cycling it, he “felt he was going to die” during the climb. It’s fair to assume you’ll feel even worse. 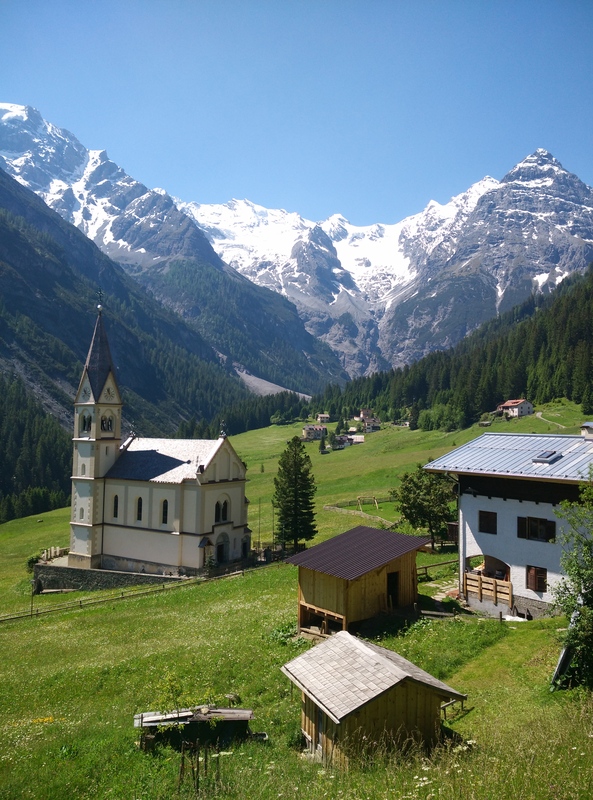 Luckily the area of Ortler Alps gives you a lot of time both to acclimate and to test the other peaks and roads before summiting this “evil mountain”. 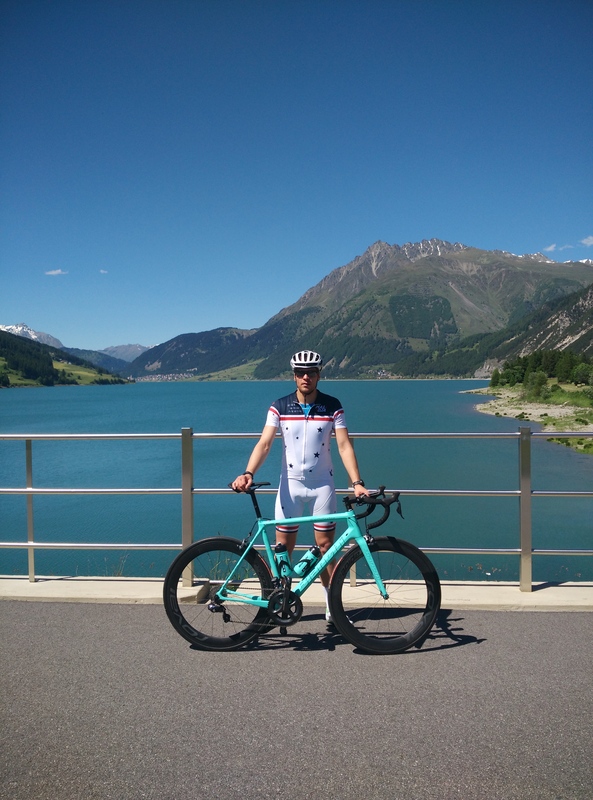 Go for a ride and wash off the swollen muscles in Reschen See or test the strength to visit the famous Livigno. We wanted to suffer and chose the path from Prato. Starting from there (on the Northern side), it boasts a vertical gain of 1,808m, and 48 hairpin bends carve their way up the mountain in what appears to be an endless road towards heaven, constantly switching back and forth the higher you climb. Not sure if it’s good or bad, as every next hairpin reminds you how much you have to suffer. Not equipped “properly” for this party, I kept my standard and went with 52/36 instead of going for 50/34 or even less. Especially the rims were a really bad decision as I rode 60 carbon wheels while I should have rather aimed for something like 24 aluminium. Lesson learned: change the cassette and wisely choose your rims/wheels. The first part (around 8km) from Prato is relatively flat and easy, around 5%. The fun part starts in Trafoi where the road is winding just below the tree line, giving superb views of peaks and glaciers and the gradient going to double figures (and also where the countdown of hairpin begins). Just 5km to the finish, there is the last possible stop to refill bottles or go for a lunch. I recommend at least stopping by and washing your face. Enjoy the magnificent scenery and celebrate it with Italian pasta and a bottle of cold beer.